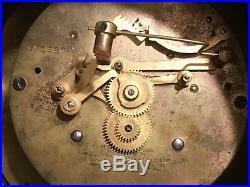 This is a Chelsea 24 Tambour #3 ships clock bell. 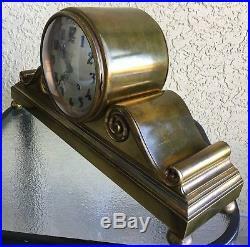 Case is bronze and brass in original and untouched finish. 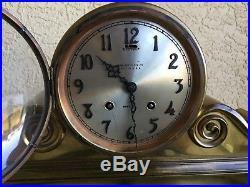 The tambour clock has a Silver 5 1/2 Dial with the special version face and ball feet. Wound clock with an 8 day run and ran perfectly with bells striking correctly. This clock strikes loudly and sounds like an actual ships bell. Imperfections are light scratches on the case and around the area on the face where wound. Hands are black serpentine with raised numbers. 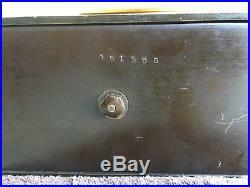 Matching Serial number on the works and bottom of the base is stamped 151586 placing the age around 1921. 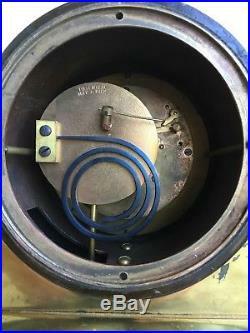 Measures 17 1/4 X 8 1/2 X 5. Comes with an original Chelsea key. 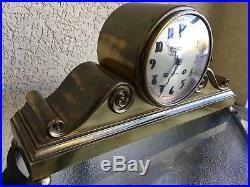 The item "Antique Chelsea Tambour #3 Ships Bell Clock All Original Brass/Bronze Ca. 1921" is in sale since Tuesday, October 31, 2017. This item is in the category "Antiques\Maritime\Clocks". The seller is "laurencewmike" and is located in Cape Coral, Florida. This item can be shipped to United States.